Are You Considering the China Waiting Child Program? Below is the story of one family who adopted through America Worldâ€™s Waiting Child Programâ€”Hank and Cheryl Miller from Florida. â€œWe passionately love Jesus, each other and our family. We have four children…three by birth and one through the blessing of adoption. Kelsey, our oldest daughter is 19; Torey is in the hands of our Heavenly Father; Kennan, our son is 15; and, our precious Kylie Grace is 3 Â½. Have you ever thought that some of the chapters of the story of your life were complete? A few years ago, we would have both told you that our â€œfamily chapterâ€ had been written. Little did we know of the incredible blessing that was in store…God still had a little editing to do! Now as we have the benefit of looking back, we can see some of the ways that the Lord was starting to â€œplant the seedâ€ of adoption in our hearts. Although we have grown up and lived our entire lives in Florida, God has put a love of other cultures and lands in our hearts. In the fall of 2006, we felt that God was asking us to travel to Mongolia and be part of an outreach team. In fact, it was through that journey, literally to the â€œends of the earthâ€, that God revealed his plans to grow our family. We truly had the opportunity to see the face of Jesus in the children at the orphanage. He was challenging each of us with â€œWhat Now? What will you do with what you have seen?â€ We watched Kelsey and Kennan get down on the floor and play with the children. God caused a place in my heart to open up that had not been there before…it was a place that was full of love just waiting to give to a childâ€¦our child. He told me that this child might not be what I would have expected…what exactly did that mean? Hank couldnâ€™t get off his mind that although they had decent living conditions and food, that at the end of the day they didnâ€™t have a mommy and daddy to love them. There had been so much to take in and we were constantly on the go, falling into our beds in the evening. This didnâ€™t leave much time for us to talk with each other about the deep things that were stirring in our hearts…but, I believe there was purpose in that waiting. So, as we left the land of gers and yaks, we traveled to China for a bit of exploring. God continued to plant seeds. As we returned home and began to de-brief from all that we had seen and experienced, we began to realize just how God had placed the same dream in our hearts. 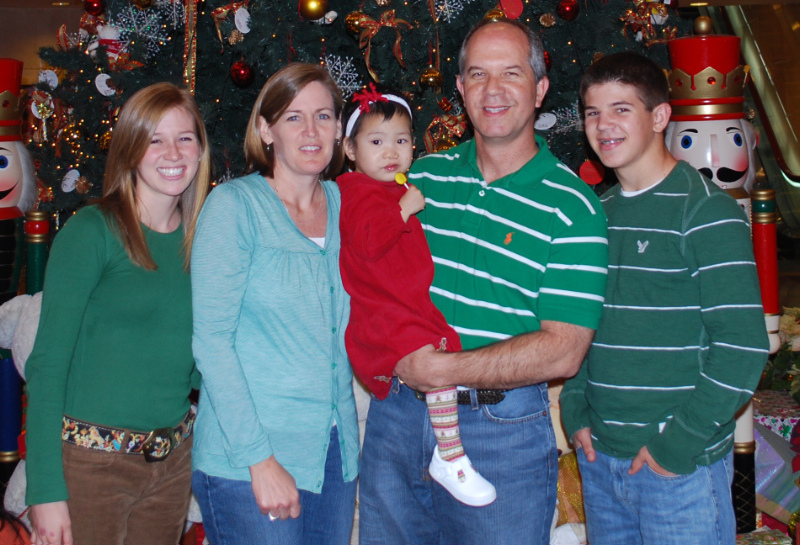 He wanted us to grow our family through adoption…we knew that without a doubt. So, that began the journey to our daughter that was directed every step by our Heavenly Father! We first applied to America World for the China Healthy Child Program in the fall of 2007. Very quickly, our hearts were intrigued by the Special Needs/Waiting Child Program…we were drawn to it although we didnâ€™t know much about it. We just had a feeling that we would receive our child through this program. So, this was what God meant when he told me our child might not be what I would have expected. He caused an excitement in our hearts to grow for a child that was a bit older…that had some special needs! You can learn more about the China or Ethiopia Waiting Child Programs by requesting an America World information packet from our website at www.awaa.org.